Due to manufacturer's restrictions we are unable to ship Zoot products to Great Britain. 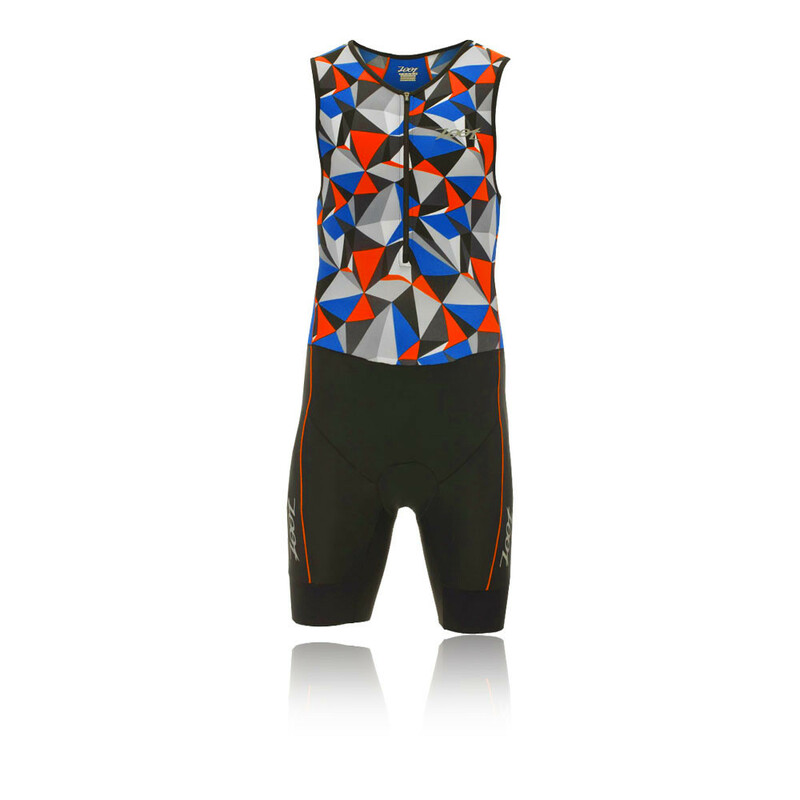 Built to perform, the men's Performance Tri Racesuit delivers the best features for your comfort. 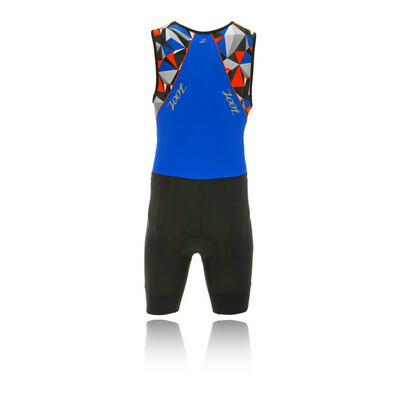 "Great fitting tri suit at a very good price." "not used yet but seems well put together, nice and light and fits well, the cycle padding is rather thin compared to standard cycling shorts but as you have to run & swim in this I suppose it has to be. We'll see how that goes?!" The Zoot Performance Tri Racesuit is developed with Performance Endura fabric which offers optimum compression and muscle support which reduces muscle fatigue and extends endurance. The fabric also has a four-way stretch which provides an unrestricted range of motion. With a SeamLink Stitch construction, it maximises stretch while providing next-to-skin comfort, reducing the risk of chafing and irritation. The racesuit is equipped with an Integra SBR 2D (Swim-Bike-Run 2 Dimensional) chamois which is constructed with micro-denier polyester yarns that are meticulously brushed to create a fleece pad that provides incredible next-to-skin comfort, shock absorbing protection and low bulk. The Trisuit is developed using BIOwrap technology, which provides targeted muscle support for increased endurance and reduces the amount of damage that can be caused by muscle vibration during intense events. The BIOwrap is located on the gripper-free leg hem which also eliminates the need for a tight band across the legs. The racesuit features a Cam Lock Zipper which locks in place and cannot be pulled up or down when locked. This allows you to control venting while riding or running and eliminates noisy distraction from a bouncing puller. Lastly, dual hip holster pockets provide storage for your nutritional needs and reflective details to ensure enhanced visibility in low light conditions. Zoot was founded in 1983 in Kona, Hawaii, the home of the Ironman Triathlon World Championships. Zoot Sports began making performance apparel that catered to elite athletes competing in the emerging sport of Triathlon. Zoot Sports is a global leader in endurance sports and is 100% focused on providing the athletes with the ultimate in performance apparel, wetzoots, footwear, and accessories. For 30 years, Zoot has been pioneering innovative product solutions that cover the athletes from start to finish and head to toe. They continue to draw on its history in the sport and its athletes to deliver the most comprehensive, technologically-advanced and complete multisport product line in the world. Zoot has grown to be a global premier endurance sports brand, distributed across 22 countries and has introduced the first Triathlon-Specific Footwear Line. Zoot continue to listen to their athletes and make no compromises to deliver the most premium multisport. Performance Endura Fabric - Helps you stay dry and comfortable. SeamLink Stitch Construction - Ensures next-to-skin comfort, reducing the risk of chafing and irritation. Integra SBR 2D Chamois - Provides incredible next-to-skin comfort, shock absorbing protection and low bulk. Performance BIOwrap Gripper-Free Leg Hem - Eliminates the need for a tight band across the legs while providing targeted muscle support for increased endurance. Dual Hip Holster Pockets - For nutrition storage. Cam Lock Zipper 12" (30.5cm) - Allows you to control venting while riding or running. Reflective Details - Enhance visibility in low light conditions. UPF 50+ Sun Protection - Protects you from the harmful UV rays.